Oceanfront porch area off living room. Living room with covered oceanfront porch area. Living room with covered oceanfront porch area. Living room with covered oceanfront porch area. Oceanfront porch area off living room. Deck view. Living room with covered oceanfront porch area. Living room with covered oceanfront porch area. Foyer area. Dining, kitchen and foyer areas. Dining area just off kitchen. Foyer area. Covered deck area off main level. Deck area off main living level. Covered porch area off main level with views of Banks Channel. Deck area off main living level. Kitchen Kitchen Kitchen Porch area off kitchen. Oceanfront master bedroom with king bed and private bathroom. Oceanfront master bedroom with king bed and private bathroom. Master bathroom. Guest bedroom with 1 queen bed, 1 double bed and shared bathroom. Guest bedroom with 1 queen bed, 1 double bed and shared bathroom. Guest bedroom with 1 queen bed, 1 double bed and shared bathroom. Shared guest bathroom. Guest bedroom with 2 twin beds and shared bathroom. Accessible from both the guest bedroom with queen & double as well as the laundry/full bathroom. Laundry area with full bathroom. Ground level porch area. Ground level porch area. Ground level guest bedroom with 1 queen and 1 double bed. Ground level guest bedroom with 1 queen and 1 double bed. Ground level hall guest bathroom. Ground level guest bedroom with 2 twin bunk beds Ground level guest bedroom with 2 twin bunk beds Street view of property. Beach view of property. Beach area. 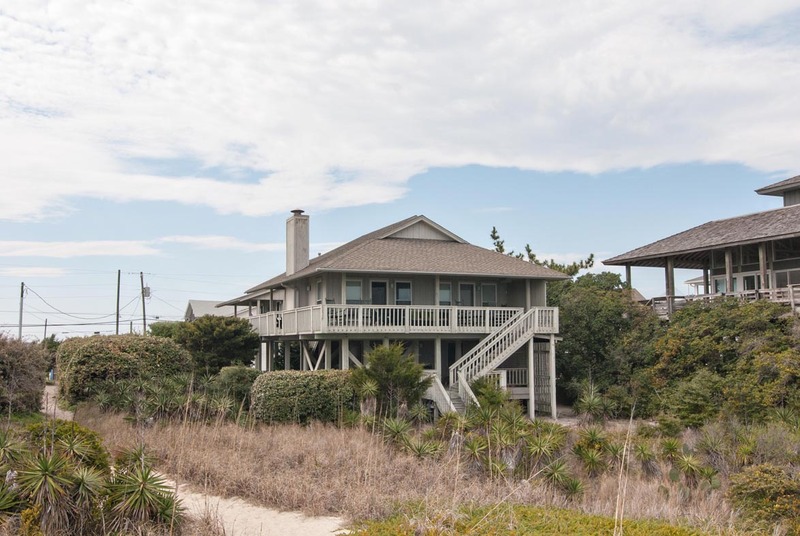 Popular ocean front 5 bedroom, 4 bath cottage at the southern part of Wrightsville Beach is waiting for your family to arrive for a fun-filled, yet relaxing vacation! Nestled in the dunes surrounded by lush foliage it’s very peaceful here! Located on a quiet street with limited public parking, you’ll have the beach all to yourselves! 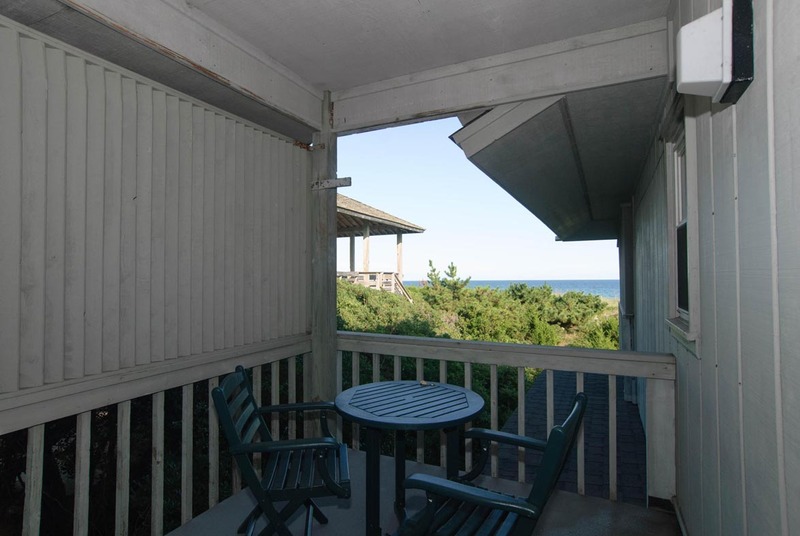 The fantastic wraparound porch offers superb ocean views and outstanding sound sunsets! A great place for gazing at the ocean while relaxing in the comfortable outdoor furnishings. Have lunch on the side porch and watch boating activity on the sound! Your private pathway weaves it way through the dunes to the pristine beach! The main level features a comfortably furnished living room that opens to the porch as does the nicely appointed master bedroom with bath. There is a separate, well-equipped kitchen, spacious dining room, and 3 guest rooms and 2 baths also on this level. Downstairs by separate entry you’ll find 2 bedrooms and 1 bath. Enjoy the lovely outdoor, shady sitting area with hammock. A perfect spot of reading a good book, or catching a nap! 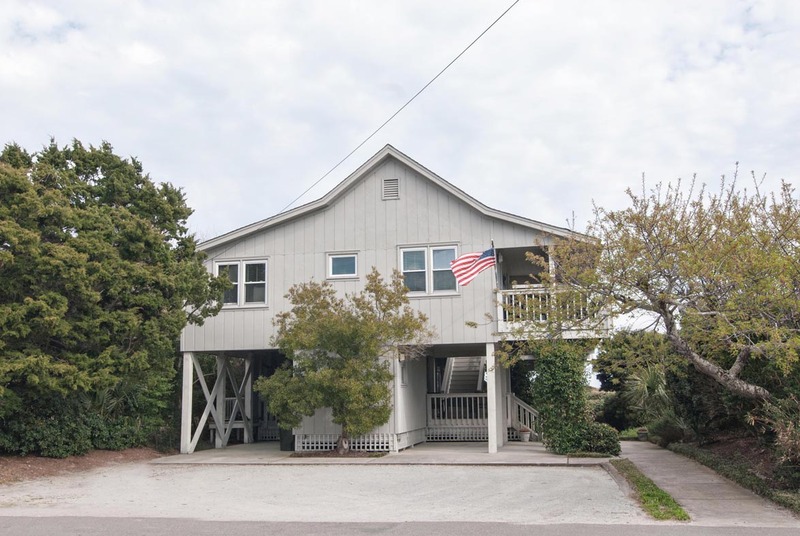 Join the hundreds of families who have special memories of their Wrightsville Beach vacation at the Bridgers Cottage! You’ll be coming back in the years to come! Two enclosed outside showers/dressing rooms. Off-street parking for up to 5 cars. Occupancy: 12. No Smoking. No Pets. 4PM CHECK-IN. Very nice and we were pleased. And a big thanks to the Bryant staff for getting us in early. We had to pick folks up at the airport and our car was full. Thank you again for your help? We have stayed in the Bridget’s house for several years and it always is the perfect place! We enjoyed the perfect week with our family at WB. Bryant Real Estate continues to provide great service and quick follow up to any issues that may arise. We had the best spot on the beach.Great access and views. Perfect beach rental for a great beach vacation! The Bridgers’ rental was perfect for our group. We loved the large, airy rooms and the rustic/antique look made it truly feel like a beach cottage. There were plenty of comfy beds and bedrooms and the layout of the bottom floor worked for our group, however, it may not work for all groups (especially small children). We were unaware that the two bottom bedrooms did not connect via interior stairwell before arrival and it worked out for our group with teens. The kitchen was large and well stocked and the dining area was great for group meals. All appliances worked, but each had a little trouble (dishwasher cycle took 3 hours, top oven cook very uneven, washing machine took forever and needed cleaned), but nothing that was a deal breaker. The best past was the vast deck space and outdoor seating that allowed for both ocean and inlet views. We loved the history referenced throughout the cottage and enjoyed our visit. We would definitely return! Top floor was cleaned. Bottom floor had not been touched. It was filthy from previous renters. My daughter and son-in-law cleaned it before it could be used. There were ants in one of the beds, top of refrigerator. We bought bug spray to alleviate ants in kitchen. My sons-in-law saw rat droppings in kitchen every morning. They did not tell us for fear of mass hysteria since we were traveling with five young girls. However, the day my daughter was leaving the rat scurried past her in the bathroom I did call bryant realty on way home to advise them. Other than those two problems the week was great. I would recommend this property but greater care and supervision must be taken in the preparation of this home in terms of cleanliness before a new renter uses it. Stephen- We are sorry to hear all wasn't as expected. We are addressing all issues mentioned accordingly! Hope you'll visit the beach again soon! Very enjoyable. The house works well for us. We had such a fantastic time at the beach. What a great house!!! Wonderful property with great ocean view. It was clean and well maintained. Both the owner and manager responded rapidly to some minor items. Excellent service. Only negative comment is the master bath is small. We have already recommended to friends. Be sure to try Portland Grill restaurant. Great spot on the beach and a great house for our family! Loved the outdoor seating and porches! Perfect spot to watch a lightning show over the water. The house had everything we needed. We love renting this property. It is conducive to our big family and we are only seconds away from the beach! The porches and outdoor areas of the home are beautiful and the main level is perfect. The lower level area could use a dehumidifier. Also there is a home next door that is under major renovation and construction noise was a factor, which hopefully will not continue through the summer.